MUOS Duplexer - Quantum Dimension, Inc.Quantum Dimension, Inc. This is a robust duplexer designed keeping in mind that the MUOS transmit and receive (uplink and downlink) frequencies are close to each other. 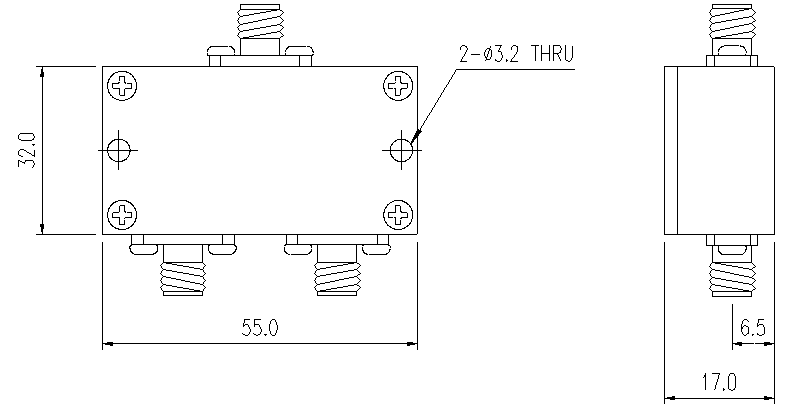 With low insertion loss and excellent out of band rejection this connectorized duplexer can be placed at the input or the output of the RF transceiver. The uplink and downlink RF channels can be combined to use a single antenna, thus reducing hardware and associated cost. Higher power handling capacity makes it feasible to use after a high power amplifier and before the antenna. The Isolation between the two frequency bands makes sure that the Low Noise Amplifier (LNA) is protected from high power feedback. Following are basic specifications of the duplexer, custom modifications can be performed on customer’s request.